What do you think of this? Unbelievably cute. Yes, I am talking about Eyebrow Scissors. 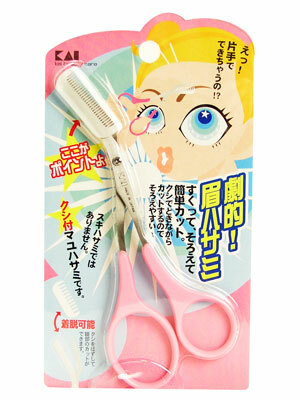 I suppose like many women with untamed eyebrows it is of great relief to find a tool that provides a simple solution. These are made by Kai Company from Japan. Let me tell you a few words about them just so it gives you an idea of their quality. Kai Company were founded in 1908 as a small factory making pocket knives. Now they produce, sell, export and import large numbers of cutting tools, ranging from kitchen utensils to cosmetic accessories and surgical implements. As a part of grooming and skincare routine I definitely give them high ranking and my eyebrows are grateful too.